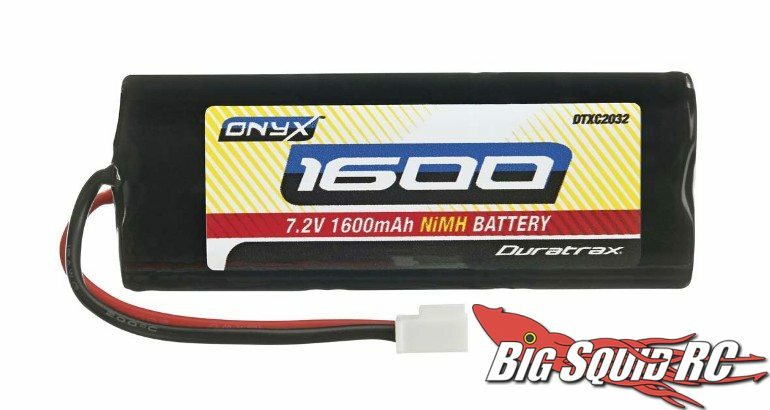 Duratrax Onyx 6 Cell 7.2V 1600mAh NiMH Battery « Big Squid RC – RC Car and Truck News, Reviews, Videos, and More! Do you have a Dromida or other small scale vehicle? If so, the new Onyx 1600mAh 7.2V NiMH from Duratrax might be a good battery for you. Soldering can take time and be a hassle so the Onyx 1600 comes with a mini connector, the type of connector that comes stock in the Dromida line of 18th scale vehicles. The Onyx was also designed to give longer run-times and to have more power than other batteries on the market. For essential information, the Onyx is street priced at $16, it has a part number of #DTXC2032, and these are shipping right now. For more details on all the batteries in the Onyx line-up simple hit This Link. Want more Duratrax news? Find it Right Here on BigSquidRC.